As much as it pains us to see this, a Flickr member by the name of DevilsRejection has cracked open Nokia's new N95 uber phone and splayed its insides all over the Web. The phone, which just launched here in the States this weekend, is going for $749. 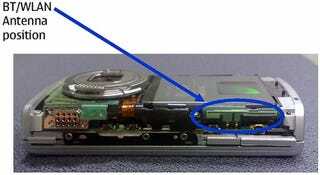 Highlighted in the dissection are the phone's GSM/WCDMA antenna and the WLAN antenna (shown above). Not for the weak of heart.